Three years before John F Kennedy declared that he too was a Berliner, a Brazilian president made a similarly striking claim: that he was a candango, one of the thousands of poor people who left their homes and families for a better future building the country's new capital, Brasilia. 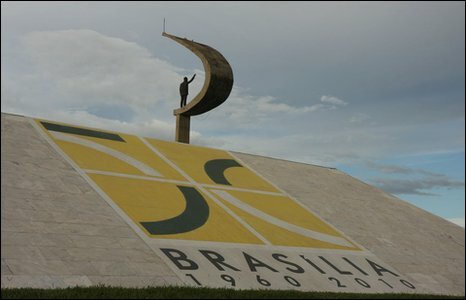 because the faith in God and in Brazil supported all of us, all this family here today, all you candangos to whom I am proud to belong," said President Juscelino Kubitschek when the city was inaugurated on 21 April, 1960. It was President Kubitschek's leadership that had won the political support and the financing for Brasilia, in the face of significant public opposition. But it was the candangos who gave their sweat, toil and - in some cases - their lives for its construction. In just three years, filled with dizzying optimism, they built what is now one of the world's most famous planned cities. "At the beginning, it was difficult. 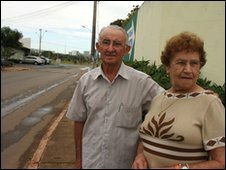 We worked like slaves - 48 hours without a break - to finish the city in time for the inauguration," said Vicente Castro, 78. Mr Castro arrived in Brasilia on a flatbed truck after hearing a radio advertisement. He now has children and grandchildren in the city. This year, as Brasilia celebrates its 50th anniversary, the candangos are finally gaining public recognition for their contribution. "Those who worked in the construction [have been] considered simple people. The public knows more about the story of the 'pioneers': people who were of a higher social class and who arrived after the city was built," says Luciana Maya, of the Living Museum of Candango Memory in Brasilia. and their role in creating not just the buildings, but also the soul of the city. I think the courage and fortitude of the candangos make them really important." Work on Brasilia began in earnest in 1957. A few hundred workers cleared the forest and carved out the city's main thoroughfares. "The solitude [was] our worst enemy," observed Manuel Mendes, an administrator at the time, in his diary. "We [had] no radio, no electricity, nowhere to go. We [satisfied] ourselves telling anecdotes or jokes in order not to die of boredom and homesickness." There were so few workers that construction companies were in a race to to hire them. Soon, however, a city began to take shape out of the forest. By 1959, an estimated 30,000 candangos were at work. Despite mostly having no experience in building work, they pieced together today's Brasilia, with its modernist icons designed by Oscar Niemeyer. And while they did so, they created their own, temporary Brasilia: a place of wooden houses and bars, cut off from the rest of the country except for the occasional airplane. The workers brought traditions from all over Brazil with them. But many commented that the place Brasilia most resembled was the Wild West. The first candango settlement was known as Cidade Livre - Free Town - because all trade was tax-exempt. In other ways, the name was inappropriate. "Freedom was what we left behind. Freedom here [in Brasilia] meant the freedom to work," says another candango, Raimundo Aguilar. But he still believes the 18-day journey from his hometown in Brazil's north-east was worth it: "Life was hard here, but it was worse back in Ceara." 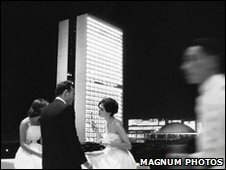 During the construction, the emergent Brasilia was a man's world: few builders brought their wives with them. 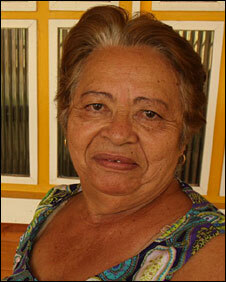 Maria Araujo's fiance left for Brasilia in 1958 without telling her. Six years later, however, he returned to marry her, and the next day, they flew off to live in the new Brasilia together. "My husband helped to build the cinemas, hospitals, the Senate. He saw lots of deaths, people falling from [the scaffolding of] the Senate. Ave Maria, it makes you proud to be able to call yourself a candango!" she said. "We adapted to life here - the only thing was the mud. Most roads didn't have asphalt, so you couldn't go out because you came back dirty." Like many candangos, she is quick to recognise a debt to President Kubitschek, who died in a car crash in 1976, having left office. "JK was someone truly special," said Mrs Araujo. "He was a father to us." Vicente Castro remembers a personal encounter with the president: "He was so humble. Once he came into a restaurant where I was having lunch. He told us not to get up, that he didn't want to interrupt our break. Later, presidents didn't value our work in the same way." Paradoxically, many candangos were unable to afford homes in the new Brasilia that they had built. After the inauguration, they moved out to Brasilia's satellite towns. But Mr Castro still lives in Vila Planalto, the site of the workers' camp where he arrived 50 years ago. Today, Vila Planalto retains a community spirit that betrays its origin. The streets are thick with fruit trees, and locals fish in the nearby lake. "It's like a city of the interior right in the middle of Brasilia," says the parish priest, Rodrigo Amaral. 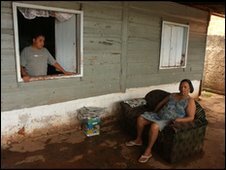 Nearby, Maria Araujo still lives in the wooden house that her late husband built. Successive governments had tried to knock down all remaining wooden houses to make way for modern buildings, but in 1988 the structures were recognised as national heritage. "Now they should recognise our ownership of the land - free of charge. Without us all this would be forest," she said. Of course, the building of Brasilia didn't stop with the candangos or with the city's inauguration in 1960. New buildings were added, and some of the modernist architecture of the 1960s, like the National Theatre. But the candangos' story testifies to an age when construction was a truly heroic exercise.